This book tackles an area that few have tackled before. With honesty and integrity the contributors examine facets of the church's mission to the Jewish people, from the nascent church of the New Testament through the failing church of the Second World War to the present. In 2008 the World Evangelical Alliance's Theological Commission published 'The Berlin Declaration on the Uniqueness of Christ and Jewish Evangelism in Europe Today.' This book contains the text of this important declaration and a series of essays exploring the issues surrounding the controversial issue of christian mission to Jewish people. Chapters include: The Uniqueness of Christ for Salvation; Salvation in Early Christianity and Early Judaism; John's Gospel and Jewish Monotheism; Martin Luther and the Jewish people; The Early Pietistic Movement and Jewish Evangelism. An articulate examination of a difficult but fascinating area from contributors who demonstrated Divine compassion for the Jewish people. 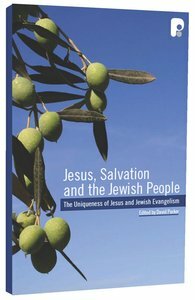 This book will encourage you to think through the issue of evangelism to Jewish people. About "Jesus, Salvation and the Jewish People"
This book covers such topics as: The Uniqueness of Christ for Salvation; View of Salvation in Early Christianity and Early Judaism; John's Gospel and Jewish Monotheism; Martin Luther and the Jewish People; The Early Pietistic Movement and Jewish Evangelism; and, Urgent Issues in Jewish Evangelism Around the Year 1900. David Parker is the Executive Director of the World Evangelical Alliance 's Theological Commission and was editor of Evangelical Review of Theology.